Rec: October - June 2002, St. Martin�s, East Woodhay, Hampshire, England. But these works don't come at all close to the intensity or the harmonic universe of Rameau's operas, for which the composer is best known. These highly attractive pieces are light and enjoyable, and full of melodic invention � just because they don't attain the same level of quality as Rameau's operas does not mean that they are inferior works. Rameau explores a variety of harmonic and contrapuntal effects among the three instruments, and the viol is never fully a solo instrument nor is it ever entirely a continuo instrument. One can appreciate this very good recording, and especially its excellent sound, yet remain unmoved by the interpretation offered by London Baroque. While technically the pieces are performed impeccably, they lack inspiration at times. The slow movements often sound slow; not deep, intense or emotive. The second movement of Concert No. 2 seems to plod, and the beauty of the harmonies between the harpsichord and violin don't become apparent. Comparing this with London Baroque's previous disc (a transcription of Bach's trio sonatas for organ) shows that this recording pales in comparison. In the Bach, London Baroque make the slow movements intense meditations. Here, I cannot feel very much apart from the notes. The musicians are more effective when playing the fast movements, and Rameau's inventiveness comes through here very well. The final movement of Concert No. 3 has the tone of some of the orchestral interludes included in his operas, and London Baroque perform this energetic music convincingly. The same is the case for the final movement of Concert No. 5, La Marais, where the violin takes off into the higher ranges and sings over the articulate harpsichord. But here, as in some other movements, the harpsichord is recorded too far back, and the listener hears more of a violin sonata than a "concert for harpsichord". Perhaps my criticism is unjust, and in part fuelled by the excellent quality of the several recent recordings of these works. 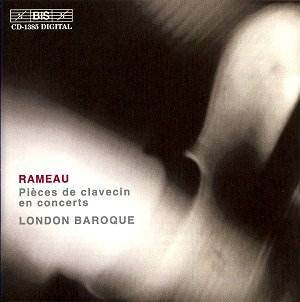 Comparing this recording with the one made by Blandine Rannou (for Zig-Zag Territoires) shows that Rannou infuses these works with much more vigour and verve, while London Baroque are more staid. London Baroque give a commendable performance, but one that remains too much on the surface and doesn't plumb the depths of these fine works.